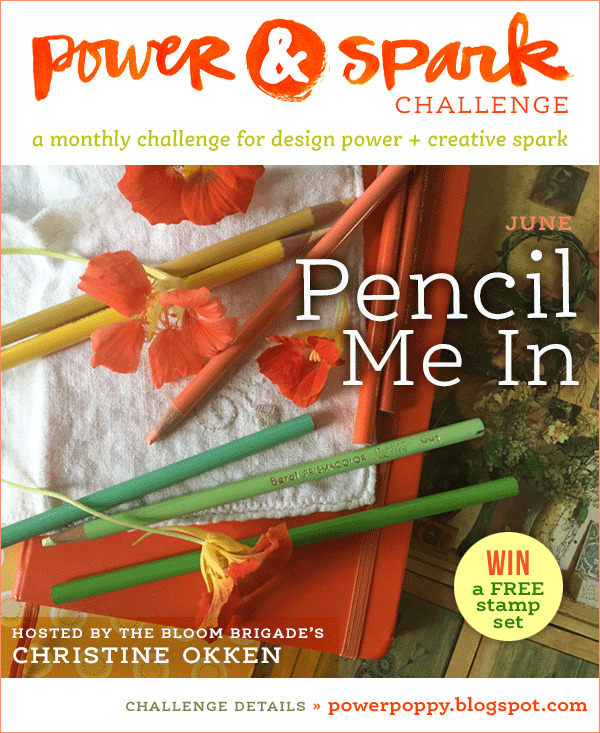 Hello again, everyone: Today I'm sharing a card that I made for the Power Poppy "Can you Pencil Me In" Challenge for the month of June. You can check it out HERE . The challenge asks us to color our images using pencils so, I grabbed my Prismacolors , paper stumps and baby oil and this is the card I made. This image from the set "Best Day Ever" and I chose to make a shaker card with it. The problem is that, when I filled the shaker with the sand, the static was so bad that it covered the entire surface, the sand just wouldn't go to the bottom so, I empty it and tried washing it with soap, shampoo and rubbing it with the Embossing Buddy with absolutely no luck. I knew I wanted to still use the sand and shells, which by the way, are from Panama City, FL. from the last Spring Break vacation my hubby and I took with our 5 grandchildren back in 2012. Anyway, since nothing was working to prevent the sand to sticking to the window, I decided to glue it to the card so, I applied some Crystal Effects with a brush onto the image and poured the sand on it and then, I put a bit on the back of the shells to keep them in place. I hope you can see the sand in this picture. I also put some Crystal Effects on the sun glasses, I also hope this picture shows that. The sentiment comes in this set, I think it's funny all of this new words young people are using now a days. The DSP is from a very old pad I bought at Hobby Lobby a long time ago, I was lucky to find this whole page in that stash. I hope you like this card, it surely took me back to those glorious days with our grandkids, walking on the beach, collecting shells, and watching them run to us to show their finds of "never seen before" treasures. We feel so grateful to have this children so close to us and to have this wonderful memories when they were little and we had them all to ourselves, grandpa and grandma sure felt awesome. I want to thank you for visiting and for your comments. Hello Everyone: Summer is finally here and I'm really enjoying the warm, sometimes hot days, you will never, ever hear me complain again about the heat, as I'm (gracefully) aging, the cold months really do not appeal to me all that much anymore, love the beauty of falling snow and the way everything looks all covered in white but the cold temperatures are no good for my bones. Anyway, this is the first time I combine two challenges, this time is, Mojo Monday and The Paper Players the theme and sketch worked perfectly for this card I made. This little mouse is sure chilling out inside this cold and refreshing lemonade glass and looks perfectly happy and contented. The image is from House Mouse and it's called "Splish, Splash, a Citrus Bath". As always, I colored it with SU markers and the aqua painter and added a bit of Wink of Stella shimmer to the glass, flower and lemon slice. The Gingham paper is from Lily of the Valley, the rest is from my stash. My card base is in Daffodil Delight and I embossed it with the Tulip Frame embossing folder (retired). Here are the sketches that inspired this card. As always, thank you so much for stopping by, I appreciate your comments immensely. If you have any questions, please do not hesitate to ask. Hello everyone: Thankfully, some of my computer issues have been resolved so today, I have a smile on my face, not only because the internet is working fine again but because of this card I made for the Merry Monday Christmas challenge , I don't know about you, but this super cute Snowmen just make happy. 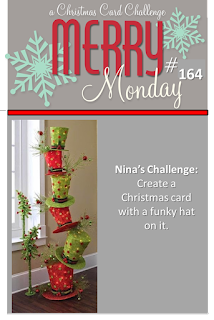 This week the challenge's theme is "Funky Hats" and think this hats the snowmen are wearing, might not look to funky but I think they fit the theme, because they're kind of big so, to me, they look totally Funky on the heads of these guys. This card was made with a combination of two stamps, one super old by Tara Reed Designs I bought at Michael's maybe 5 years ago and the other one, which is a new Power Poppy set by Marcella Howley called "Merry Littles", it has a whole lot of little images, all of them beautiful, for this card I used the hat. I stamped the snow men on water color paper with Stazon Ink and with an Extacto knife, I cut their noses just on the sides to be able to fit the hat under them, then I stamped the hat 5 times, colored them and fussy cut them, applied some Crystal Effects and sprinkle some fine glitter. Here is a close up of this cute hats. I colored the hats, scarfs and the little snowmen noses with SU markers and the aqua painter, cut a bit of gold glimmer paper for the top and bottom of the image and that was it. Not complicated and rather fast to finish. Thank you so much for visiting and for your comments. As always, I read each one of them and appreciate each word you write. If you have any questions about this card, please feel free to ask me.